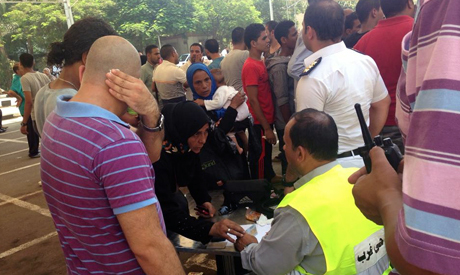 Security forces on Sunday began a campaign to move downtown Cairo street vendors to the parking lot at Torgoman bus station – a busy transit point in the heart of the city. The day began with security forces intensifying their presence downtown with armoured vehicles, riot troops and backed by military forces, as vendors began moving to the new location. 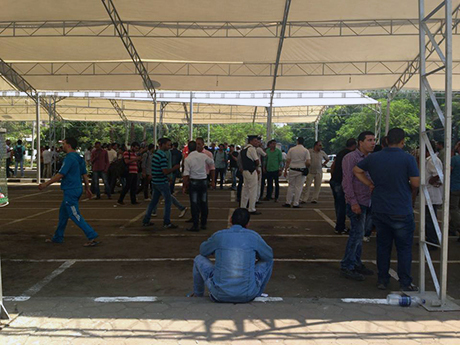 Police and governorate officials – including Ali El-Demerdash, head of Cairo governorate's security – were on hand at the parking lot to assist the vendors with the move, according to Al-Ahram's Arabic news website and state-run news agency MENA. Officials informed residents of the area about the move and also removed all cars illegally parked at the bus station's garage. It's not the first time officials have tried to shift street vendors from downtown's busier streets. 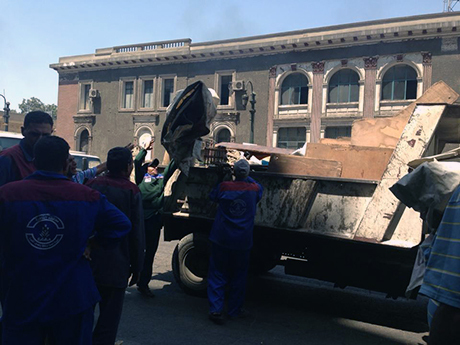 There have been repeated attempts to clear vendors from streets like Talaat Harb, 26 July and Ramses in central Cairo. Police action has at times led to clashes with vendors, who say there are no legal alternative locations for their stalls. The interior ministry launched a nationwide concerted campaign shortly after the June inauguration of President Abdel-Fattah El-Sisi to move unauthorised street vendors from the streets of Cairo and other major cities. Officials argue that the campaign aims to increase the presence of security forces in downtown and reduce traffic congestion. Cairo's governor issued a decision earlier in July to temporarily move downtown street vendors to Torgoman's car park, arguing that the vendors cause traffic congestion and block roads. Vendors were told that they would be moved to a permanent location at a downtown mall – yet to be constructed – in four months time. Cairo governorate's deputy leader Ayman Abdel-Tawab told state news agency MENA on Sunday that vendors won't be forced to move to the bus station's garage – but that they won't be allowed to continue selling their wares on the streets. "As of today there will be an extensive campaign by police to remove street vendors after they have been transferred to Torgoman. We will not allow them to remain on the streets," Abdel-Tawab said. Abdel-Tawab said that the car park can hold up to 1,750 street vendors. The head of the Street Vendors Syndicate, Ahmed Hussein, agreed with the figure – but he said many of the syndicate's registered vendors were not able to get places at Torgoman. "I don't understand how the permits were issued. I don't know any of the vendors who were given places in the garage," Hussein said. Those unable to get permits gathered in front of the garage to demand a spot. 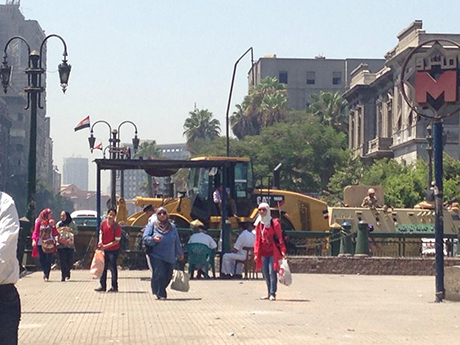 Hussein said all of the protesting traders were syndicate members. Some of the protesting vendors said the spots in the garage had been allocated according to corruption and favouritism. Meanwhile, a vendor who says he has been working in Tahrir Square for 20 years said traders had to register their names with the governorate to get a permit and be given a specific number. Other vendors said they registered but later found others had taken their spots in the garage. They may be considered a nuisance by officials – but street vendors are part of Egypt's vast informal sector that makes up 30 percent of the economy and employs 40 percent of the labour force, former finance minister Ahmed Galal said in January. With high unemployment rates – 13.4 percent of a labour force of 27.3 million, according to official statistics from 2013 – many street vendors are worried that they will lose their trades. Speaking to Ahram Online, a 45-year-old vendor said he feared losing his business. "Do you think buyers will come all the way from Tahrir Square to Torgoman garage to buy my products? I personally doubt it very much," he said. Another vendor complained that Torgoman has neither adequate facilities nor services. Others said the government does not consider their needs and only cares about reducing congestion and improving security. Street vendors backed up traffic in downtown Cairo since Egypt's 2011 revolution when police presence dwindled considerably on streets. Occupying main avenues in the capital's center, street vendors have been blamed as being one of the main reasons of traffic-congestion in one of Africa's most densely-populated cities.